When Tom Smith heard about plans to recapitalize First State Bank in Danville he immediately wanted to become involved in the project. Casey Crawford, a co-founder of Fort Mill, S.C.-based Movement Mortgage, made a $10 million personal investment in the bank in June, making him the majority stockholder. “This is a startup with history, and the history of the bank appealed to Casey,” says Smith, who is now president and CEO of the bank under its new name, Movement Bank. Smith formerly was the founding president of a community bank in North Carolina. The bank was founded in 1919 as Savings Bank of Danville by African-Americans wanting to provide financial services to people denied credit by mainstream banks. In recent years, however, the bank has struggled. In 2011 the Federal Deposit Insurance Corp. and the Virginia Bureau of Financial Institutions issued a consent order in an attempt to improve its financial performance. The bank’s condition “got more critical in 2016 and 2017,” Smith says. Since Crawford’s investment, the bank’s assets have grown from $28 million to $39.5 million. A native of Falls Church and a graduate of the University of Virginia, Crawford played in the NFL for three seasons. His stint included winning a Super Bowl ring as a member of the 2002 Tampa Bay Buccaneers. He previously played for the Carolina Panthers from 2000 to 2001. Since its founding in 2008, Movement Mortgage has grown to more than 650 locations in 47 states with 4,000 employees. The company ranked No. 1,295 in this year’s listing of the nation’s fastest-growing companies by Inc. magazine. Movement Mortgage had revenue of $579.9 million last year. Its three-year revenue growth rate was 316 percent. 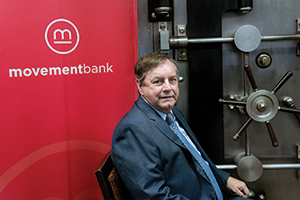 As part of its relaunch, Movement Bank is enhancing its existing products. In addition to banking services, it provides mortgages as well as commercial and consumer loans. “We are a full-service bank,” Smith says.